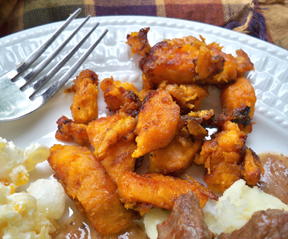 Yummy fried sweet potatoes with a light brown sugar glaze. 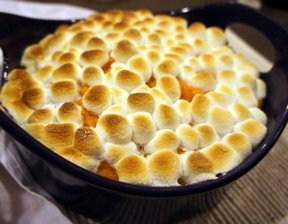 Another way to enjoy delicious sweet potatoes. 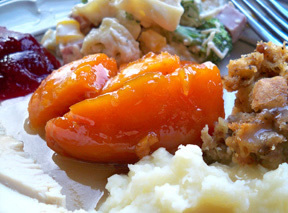 Peel sweet potatoes, cut into quarters or a little smaller if potato is large. Place in a saucepan and cover with water. Boil just until the potatoes begin to soften. Drain water and cut potatoes into thick slices. Heat the butter in a large skillet. When butter is hot, add the sweet potatoes. You should use a pan large enough so the potatoes are not piled on top of each other too much. Fry the potatoes in the butter over medium-high heat until they begin to brown. If necessary you can add a little more butter as you are frying them. Salt and pepper the potatoes to taste if desired. Once they begin to brown, reduce the heat to medium-low or medium and sprinkle the brown sugar over the potatoes. Continue to fry until the potatoes are tender and glazed. "Very good, especially the crispy edges on some of them. Next time I will fry just a little longer so there are more crisp ones. 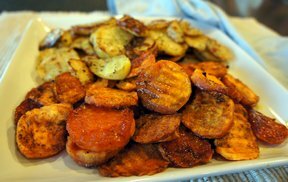 These made a nice side dish with grilled hamburgers."